This step-by-step 48-page guide covers DSLR and Webcam (colour and mono) imaging, using either a long telephoto lens or a telescope, showing how to stack DSLR Images to reduce noise and create a much smoother image. 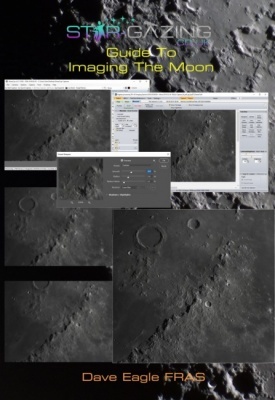 Webcam image processing (in Monochrome or Colour) shows how to add overlapping images together to create full-disk mosaics and reveal fainter features along the terminator. The image is then sharpened to reveal more detail and if colour DSLR or Webcam images are taken, saturating the colour to bring out subtle soil colours.